Looking for a reliable charter bus rental in Chula Vista, California? San Diego Charter Bus Company provides top-of-the-line bus rentals to travelers in Chula Vista and beyond, providing a smooth and stress-free trip for you and your passengers! No matter what brings you to Chula Vista, you can rely on San Diego Charter Bus Company to streamline all of your group’s travels. Provide a shuttle service for your wedding or business event, take your students on a field trip, attend a sporting event, or book transportation for your family gathering; whatever brings you to Chula Vista, we’ll make sure you’re paired with the perfect transportation option. 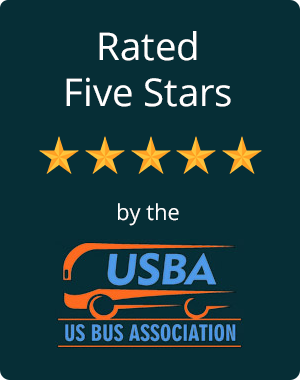 We only work with qualified, leading bus providers in Chula Vista and throughout the San Diego metro area to bring you the best in the business. Book a full-sized motorcoach for large groups, a compact minibus for small groups, or any combination of models to customize your rental to your group’s unique needs. Buses come with modern amenities such as plush seating, panoramic windows, air conditioning, WiFi, on-board restrooms, and more, many of which are available at no additional cost! Organizing a wedding or corporate event can be a hassle, especially when you’re dealing with a long guest list. Let us help take one aspect of planning off of your plate by organizing your event’s transportation! Guests can enjoy a private shuttle service between hotels and convention centers, ceremony spaces, and reception venues, eliminating the need to drive themselves and risk getting lost. Your event will progress right on schedule as every guest is smoothly and efficiently transported through Chula Vista. Whether it’s for an educational field trip or an important sporting event, San Diego Charter Bus Company has all of your Chula Vista school event travel covered. Load your students onto a modern, comfortable bus and enjoy premium amenities such as reclining seats, air conditioning, WiFi, power outlets, and more. Ditch the old, uncomfortable school bus for a modern coach that is guaranteed to provide a comfortable ride! We’ll also make sure you’re paired with an experienced, professional driver who will ensure that you and your students travel safely to every event on your itinerary. Whether you’re spending an afternoon at the Living Coast Discovery Center or taking a stroll through Chula Vista Bayside Park, San Diego Charter Bus Company is here to ensure that your group travels safely to every destination on your trip’s itinerary. Write up a schedule filled with what you’d like to see, and let a professional driver handle all navigation throughout your trip! No matter where your travels take you in Chula Vista, you can rely on San Diego Charter Bus Company for safe travels. Give our 24-hour team a call today to learn more about our services! We’re always happy to provide you with more information and to calculate a free, personalized quote for your trip. Call us today at 619-209-7804 to get started.